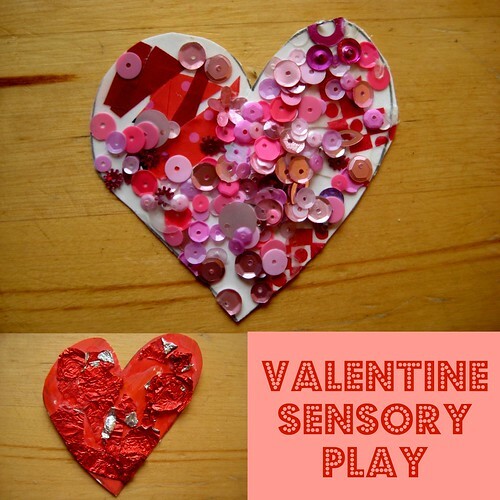 Show your babies and toddlers some love this Valentines day with some sensory play that’s adaptable to include even the youngest children. These love hearts are oh so touchy feely! A wonderful creative project for kids to make and explore. Start by drawing lots of heart shapes on some card – all shapes and sizes, let the kids have a go! 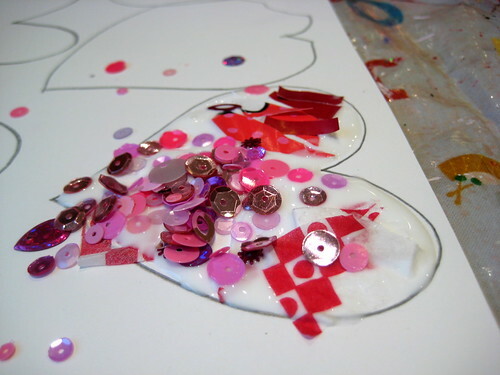 Spread on some strong clear drying PVA / craft glue and your love heart canvas is ready to decorate. 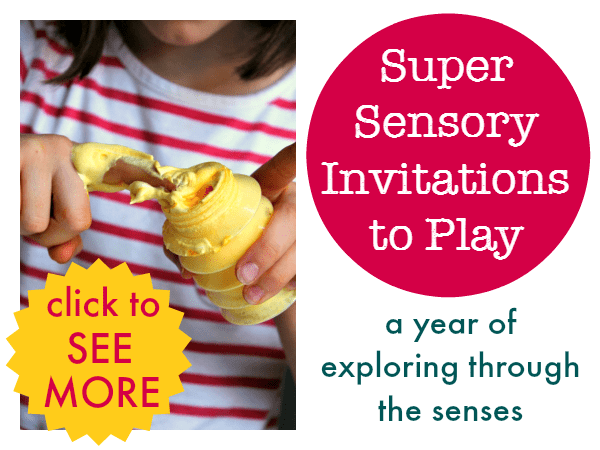 Invite the children to sprinkle and press on all sorts of materials. Try to provide as many different textures as you can find. 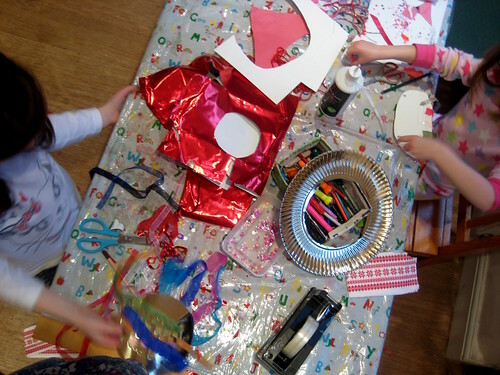 Toddlers can certainly join in with all this and even babies might help. If your baby is too young to do some sticking they can explore some of the materials while older siblings (or you!) create the hearts for them to explore once they’re finished. 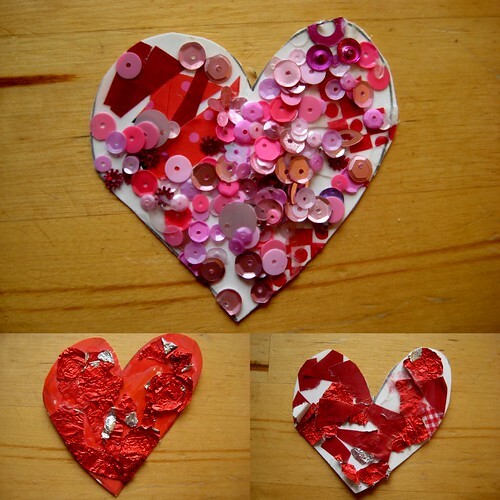 As you’re using a strong craft glue most items should stick well to the hearts and still allow you to feel the full variety of different textures. If you’re using small items, such as glitter and sequins, an extra layer of glue over the top helps to hold the materials together. Adding extra folds and crinkles to the papers and fabrics adds even more texture. The finished hearts look wonderful as a touchy feely art gallery. Hang them where your children can reach them to feel the different textures. You could also stick them in to a journal or scrap book to create a sensory book to share with babies, but be sure to read the book along with them to make sure none of the materials get free and end up in their mouths. Very pretty! I bet your girls LOVED making those! How fun!! I would like to invite you to share at our Sharing Saturday party at http://craftymomsshare.blogspot.com/2012/02/sharing-saturday-5.html. Thank you! I love these! Perfect for both of my boys!! And great for language development! !